Discussion in 'F1 2019' started by GTPNewsWire, Mar 28, 2019. 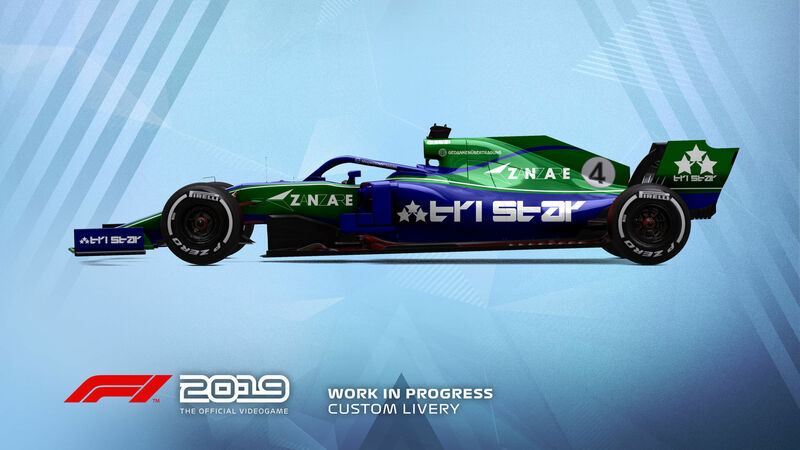 This article was published by Kyle Patrick (@SlipZtrEm) on March 28th, 2019 in the F1 2019 category. And like every other piece of media you forget to mention the obvious F2 car at the end. j0nny0093, FoRiZon, hrusa2 and 6 others like this. That’s good news it releases earlier in the F1 season this year. I hope eventually the series releases at the beginning of the F1 season, similar to other sports games, such as NHL, NBA, etc. In F1 2018, doing a season where I already knew half of the real life drivers had already signed with other teams or been dropped, didn’t help the career immersion. Maybe just me, but it felt a tad off because of that. R9NALD9 and potvinsuks like this. They don't know how to implement features via updates or what? It's very unusual to have a year-based sports game institute updates after the season ended. NASCAR's franchise is unique in this aspect as for the past two years, the game that came out 3Q in one year had updates for the next season. In terms of F1, which came out in August, they had no need to include roster moves AFTER the 2018 season ended because, it was to reflect the 2018 season and they expect people to buy the 2019 game for the update. Theres also a huge amount of licensing. It's not just a case of switching names in the game. Customizable bespoke designed car is a great idea and the F2 will be very cool to race with. Perhaps it’s not so “obvious”, then? I know I certainly would not have noticed it. What a rude way to offer feedback to @SlipZtrEm. He didn’t “forget” anything. FT-1, Guffaluff, byoung and 5 others like this. F2 eh? Nice, I’ve wanted a “road to F1” type of game for a while, a game where you could go through the lower ranks of open wheel racing. Ok, it’s just an F2 but it’s a start. It’s not massively obvious but the pointy shark fin caught my eye, definitely not an F1 car. I hope the spectator controls have alot more functionality this release too, a nice replay option wouldn't be bad either. Do you include codemasters in that? Silly people forgetting to mention something THEY designed. RustyCitroen and potvinsuks like this. I wasn't being rude just pointing out that somehow every media organisation (except now Aarava in a second video) had missed it. You know me well enough to know I am not saying that with rolled eyes. I have even written for your site before back in 2016 so I know what it's like. Maybe I could have worded it differently for which I am sorry but I don't appreciate the way you make me out to be a . It's a teaser trailer, it's not the first time a company have done this but usually the independent media are all over it as it drives up the number viewing their sites. I wasn't being rude just pointing out that somehow every media organisation (except now Aarava in a second video) had missed it. You know me well enough to know I am not saying that with rolled eyes. If you tell someone they have "forgotten" something "obvious" when they did not and it was not, that's rude. And I don't appreciate the way you tried to mock someone who has worked very hard for the site this week. I'm so excited! Never thought they will let the cat out of the bag so early. Really amazing. Just three months. It hasn't been 3 weeks when I got my platinum trophy in F1 2018 and thought "Damn! Announcement is still two months away and the game even 5 monts". How wrong I was and I'm so happy about this. GTMajarcus and potvinsuks like this. I am excited for the latest rendition of this series. However, the ONE thing that I really hope they change is the way Online Lobbies are set up. As of now, It is very difficult to invite a dozen or so friends and have them enter the lobby once you have entered the actual track. Anyone else who wants to join at this point is locked out of the room and this is incredibly frustrating for anyone who wants to run private leagues. GTS and p CARS are excellent programs at utilizing this feature. I just don't understand why the F1 games can't implement this too. GTMajarcus and Interstellar9 like this. Man I wish codemasters would develop nascar games. Matt83 and TheGeologist like this. Now that there's a generic F1 car in the game, how about a "My Team" management feature? There hasn't been an owner-driver in F1 since Fittipaldi in 1980 — it's time for at least an imaginary one. They did IndyCar for a couple games. No one bought them despite being quite good. Just simply isn't popular enough to do. I'd love a Motorsport Manager type mode. I'm surprised at the earlier release, as there's a limit to how early they can really go with teams not unveiling real cars until testing. I just bought 2018 on a ps4 sale because I figured 2019 wasn't coming until September or so. I was wondering what car that was at the end because of the different shark fin. Hopefully they have realistic F2 drivers, teams tracks etc. Also, WE NEED A LIVERY EDITOR! The 'Manage Team' feature should also totally be there. Doesn't F2 have the same schedule as F1? Obligatory no VR no buy. Disappointing. I wish they'd take a year or two off & create a brand new graphics engine. Every year it's been basically the same game like fifa. Driveclub came out 4 & 1/2 years ago and looks 10x better. Both Forza Motorsport & Horizon look better & Horizon is a big open world. I'm not saying the F1 games are ugly but they honestly don't look that good when they could look incredible. I see being friendly and trying to nicely explain my position doesn't work. I already told you I wasn't mocking him but I guess you wish to be hostile and mean still. I guess they would be working on a new engine for the PS5 era? No point doing it now for PS4 when its coming to the end of its cycle..